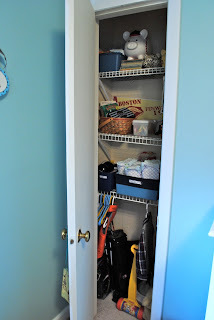 Lately we've been working on our little master closet, getting it cleaned out, painted and organized and we actually have more updates to share with that soon. 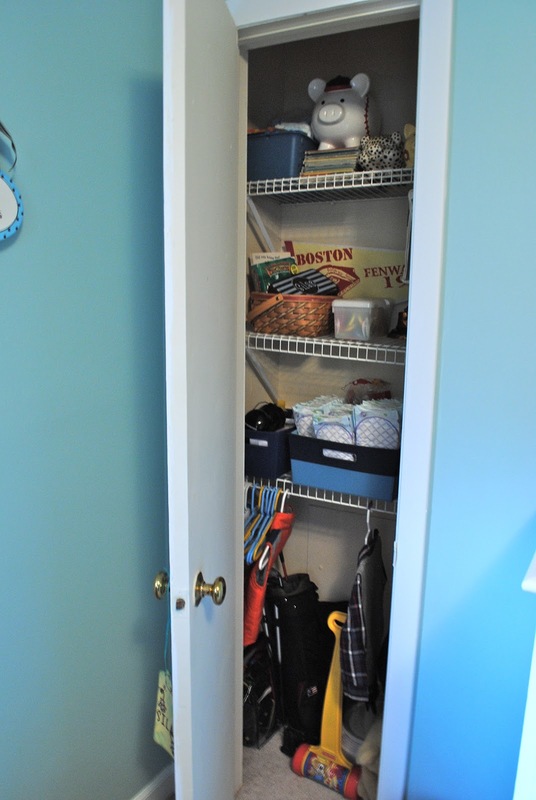 Next, we will be moving on to the laundry room/area (not sure if it counts as a room exactly). But, in the meantime it seems like getting organized in one area as spurred on more organization in other areas of our house. Our little boys room was in much need of a clean out and shuffle. 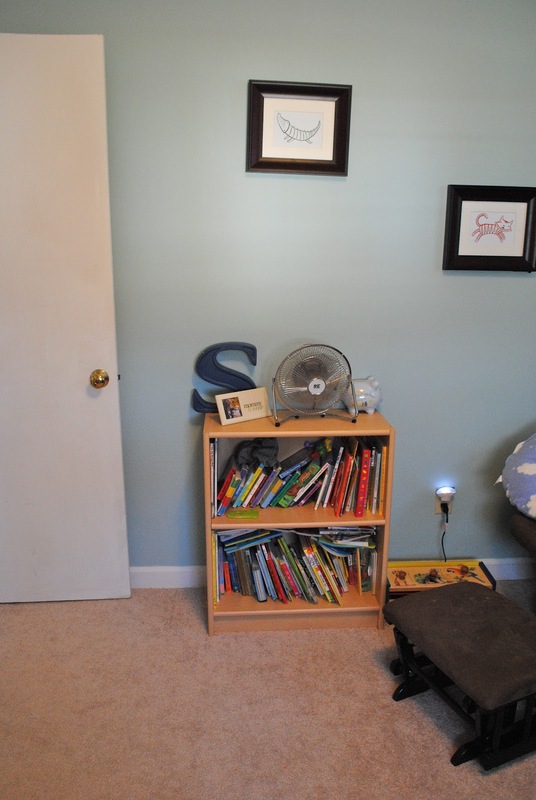 His room had not changed much since he was born and it was starting to drive me crazy. Now that he is 15 months we needed to weed out some of the things he never plays with and we never use anymore and make room for the things he likes. 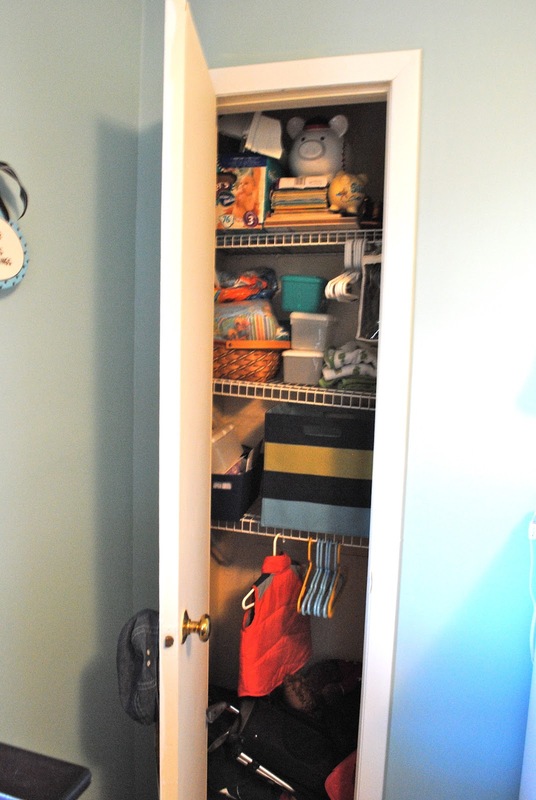 I also felt like there were a few hazards in his room, like cords dangling and breakable objects that before wasn't a big deal since he wasn't into everything - but really needed to be addressed. And here it is now...let me say that I promise his room color did not change - I guess the lighting was different when I took these pictures since it was a different part of the day. The room color is closer to the first but almost in between the two. 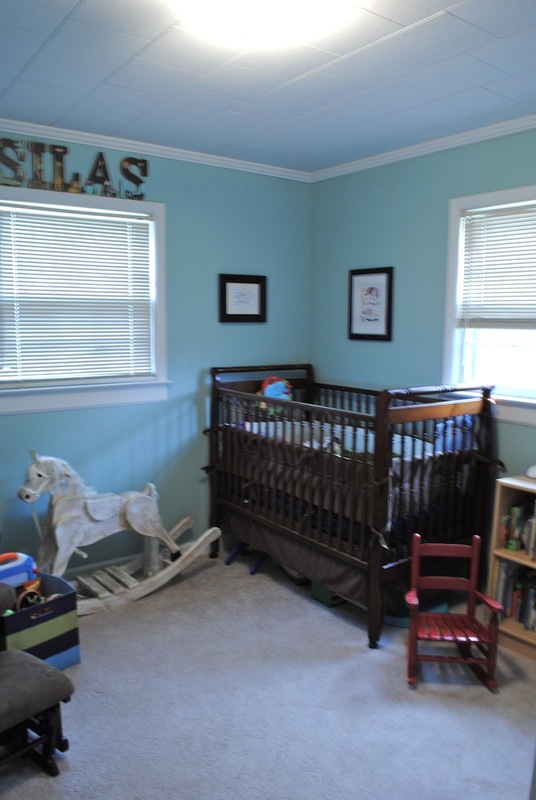 Silas actually loves his new room set up. He plays in there a lot more than he did before and he has better access to his toys and I don't have to worry about crazy cords or something being broken. 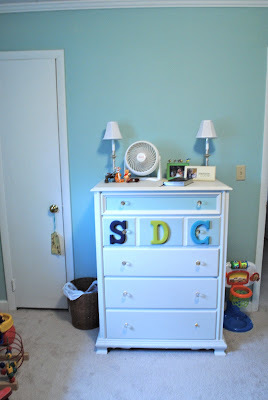 One of the things we got rid of to make more space was this changing table. 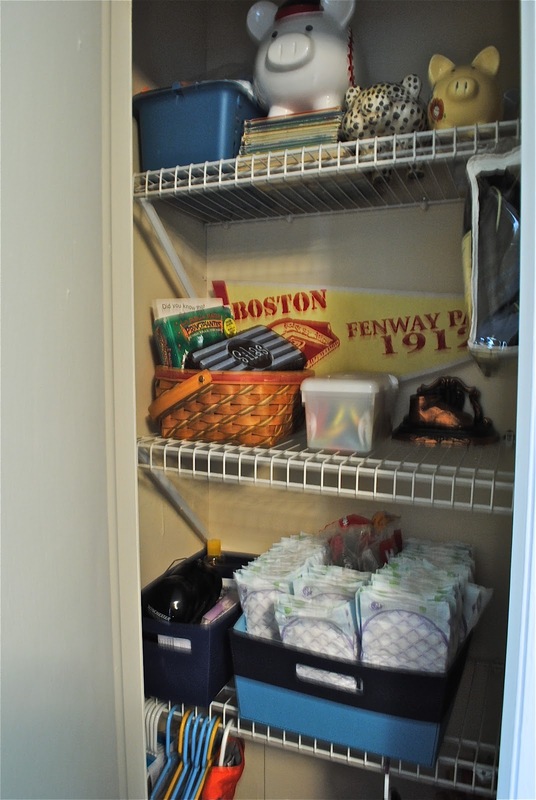 We just weren't really using it anymore (well, not as a changing table) - it had just become a junk collector. His room is so tiny, it's the smallest in the house so space is at a premium here. You can also see that we his awesome handmade rocking horse tucked in the corner and yes, that is a dangling cord. 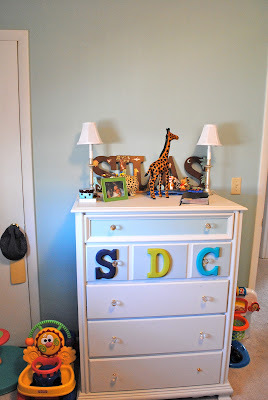 So out went the changing table - which meant we had to find a new place for all of those bins and toys. 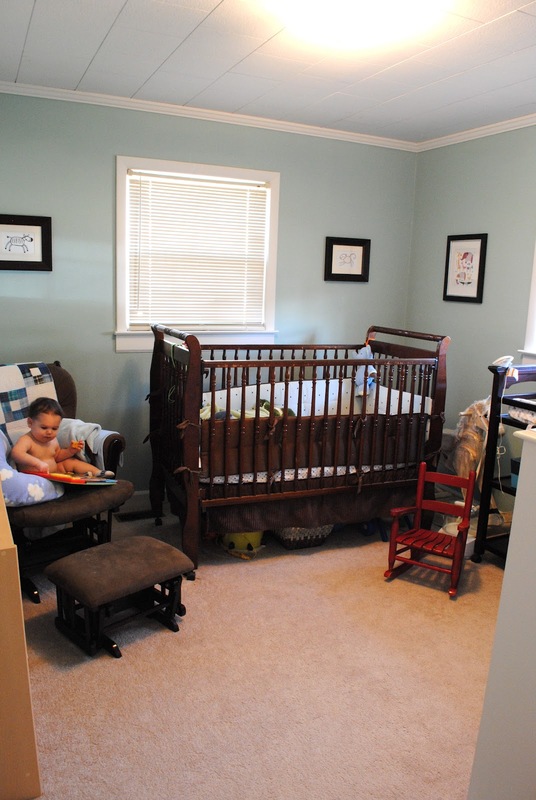 We moved the crib over and then moved his little bookcase to this side with his little rocking chair (which was actually my dads). I love this little reading spot - he actually sits in that chair a lot and "reads". 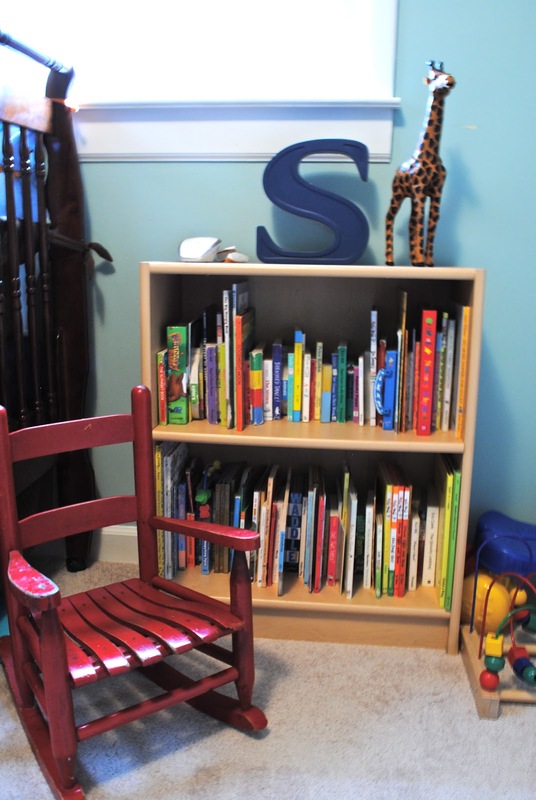 This also provided a spot for me to hide that cord - out of sight and little hands. His bookcase used to be right across the room on the other wall...I didn't like the fan there - another cord dangle spot. Now it's a little space for his big boy toys - and no more cords. He loves playing here too. 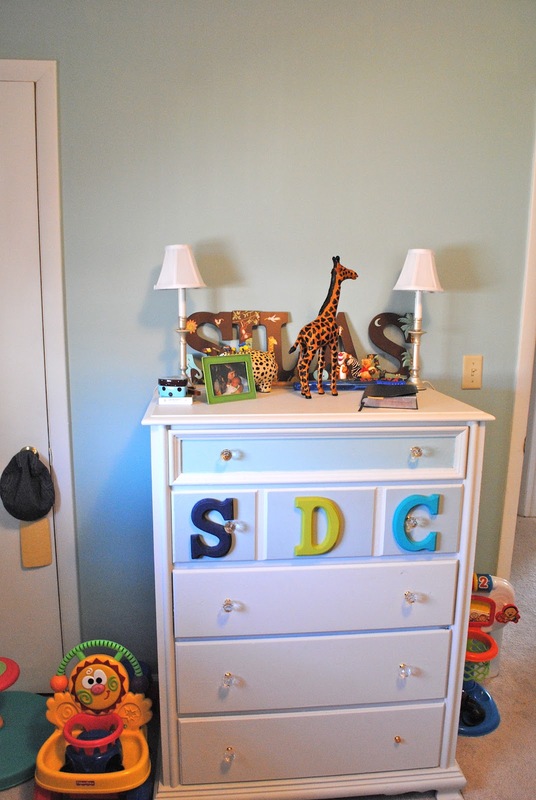 His dresser top was a jumbled mess too, we still had his name letters sitting here and they really needed to be hung. We moved his fan on his dresser so it's now unreachable and the cord is tucked away behind the dresser. This dresser top received a much needed clear off. His closet got a clean out too. 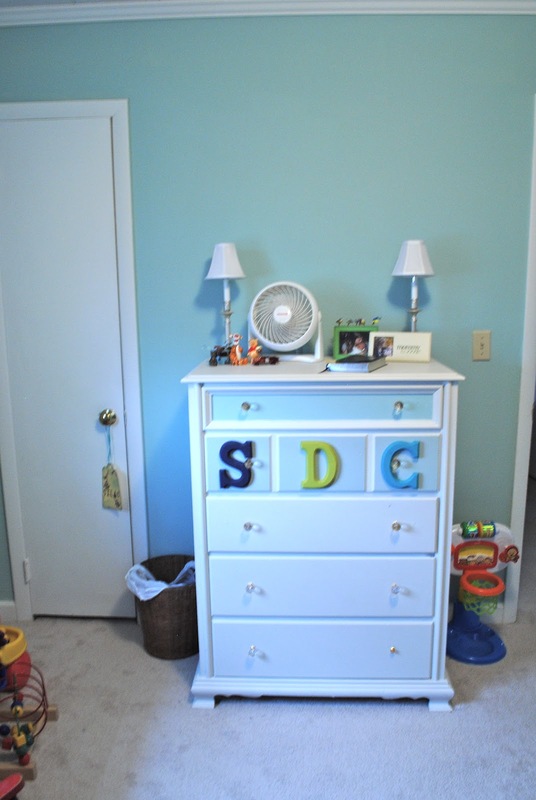 It might be hard to tell, but we got rid of a lot of stuff that was not being used - and in turn it was filled with things that needed a new home (a lot of the things that were on the changing table ended up here). So here's a quick before and after - you can also see that we hung is name over his window. I like that he can see it now and he points to it and notices it often. There are still lots of things I would love to do in his room - like new window treatments for example but as of right now, Silas is loving it and I'm happy with that. Also, I love that we spent no money and gave Silas more space and a better place to play, sometimes it just takes a little rearranging and clean up to get a space you like. It's a really cute room. Funny how different lighting can make things look!